Gillette Stadium sometimes referred to as The Razor by fans, is the name of the 68,756 capacity multi-purpose sports stadium located in Foxborough, Massachusetts. 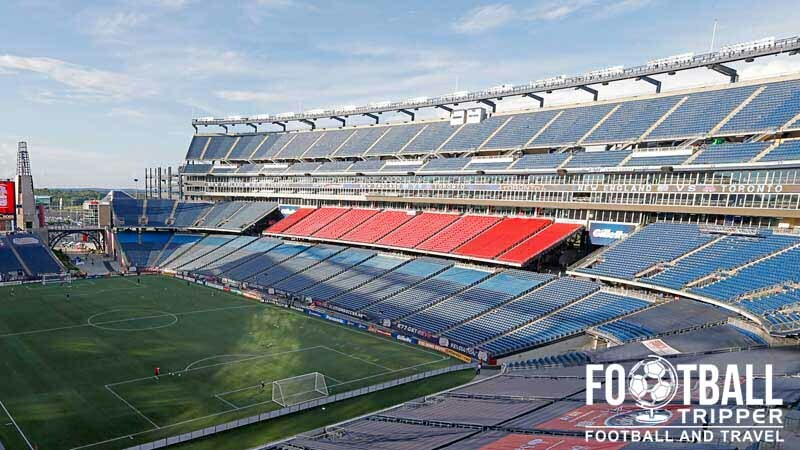 Home of Major League Soccer side New England Revolution, the capacity of the Gillette stadium is reduced to 20,000 for soccer matches and was originally known as CMGI Field. Originally known as CMGI Field, the paint on the signs was still wet when Gillette purchased the naming rights from the technology and logistics company in 2002 after the “dot-com” bubble burst. The Stadium was less than a year old when this happened, but fortunately the Boston based shaving company stepped in to create a long term association with the local sports, with some fans even referring to the ground as The Razor. Although to European Soccer fans it very much appears to be crafted in the American Football mould of large outdoor stadiums, it was actually envisioned as a multi-purpose sporting arena. 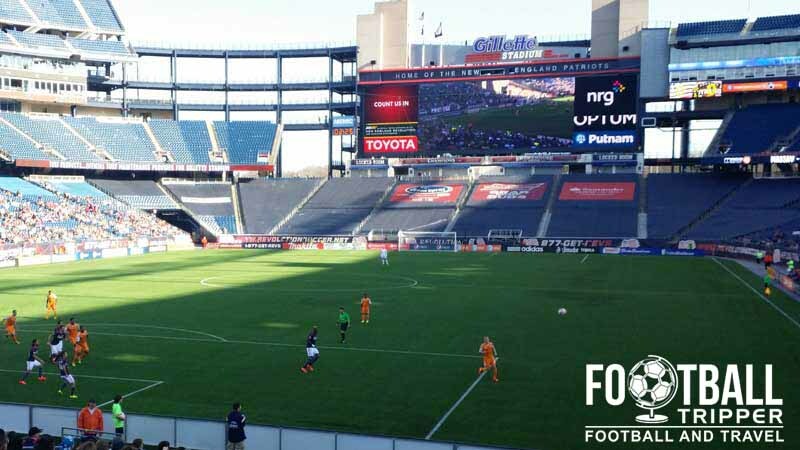 In fact, the first sporting event to be held at the new stadium was a soccer match and New England Revolution have been permanent residents ever since. Designed by Populous Architects who have designed such iconic English grounds as The Emirates, Wembley, and the expansion of the City of Manchester Stadium, The Gillette has an excellent soccer pedigree and even manages to retain its sense of intimacy in the lower tiers despite being built to seat 68,756 fans. Costing a reported $325 million at the time which equates to around $426 million dollars by today’s estimations, The Gillette Stadium is a world class sporting arena and as the popularity of Soccer grows in the states it’s reasonable to believe that Revolution will be able to eventual sell out their home matches. Besides the 2002 MLS Cup final LA Galaxy which attracted over 61,000 fans, two of the largest attendances to date have been when foreign teams have visited for the World Football Challenge series of matches. 2009 saw 42,531 fans AC Milan take on bitter rivals Internazionale, and two years a crowd of over 50,000 saw New England Revolution lose 4-1 to Manchester United. Gillette Stadium is comprised of four stands: North, East, South and West. As part of the stadium complex there is the Patriot Place which is a large indoor mall combining shopping, dining and pre-match entertainment. The three most prominent bars are Toby Keith’s I Love This Bar & Grill, The CBS Scene Restaurant & Bar and the Howl at the Moon Patriot Place. Inside Gillette Stadium beer is on hand courtesy of the club’s official provider, Budweiser. Inside The Patriot Place there are over 14 restaurants to choose from including Five Guys Burgers, Olive Garden and Red Robin. The concourses within the stands have numerous kiosks which sell typical fast food such as hot dogs, fries and hamburgers. At least for Patriots matches everything is run in-house by the club’s commercial food and beverage director, unlike other teams who tend to outsource contracts to various caterers. A the ground there is The ProShop which traditionally just stocked Patriots NFL merchandise, however with the growth of Major League Soccer it now also stocks New England Revolution goods. Don’t forget that you can can also purchase Revolution jerseys and apparel online from the official MLS Store. The typical jersey colours of New England Revolution: Dark blue accentuated by strips of red and white. 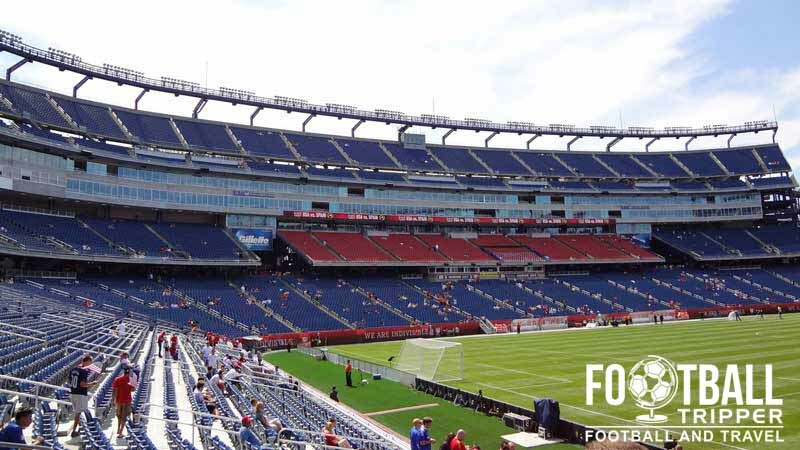 Stadium tours aren’t currently available to the general public however they can be booked as part of a Corporate or social event booked at The Gillette. 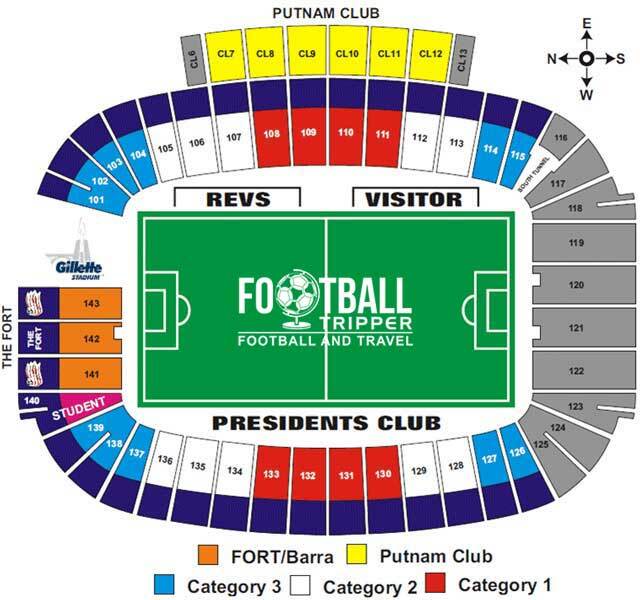 Single tickets to see New England Revolution play at the Gillette Stadium are available to purchase online from the club’s official vendor, Ticketmaster, and are generally priced within four categories as shown below. Please note that the prices above are subject to sales tax and booking fees, and only indicate the lowest possible price you will pay. Gillette Stadium is located between Wrentham and Foxborough just off of Route 1 . A New England Sign proudly placed above the stadium’s main entrance. Parking during Revolution games is currently free and Tailgating is permitted for up to two hours before kick-off. To view all available car parks please view this 2015 map. There are unfortunately no forms of public transport available which can take fans to and from Gillette Stadium on matchdays. If you’re visiting from out of town or on holiday your best bet would be to get a taxi to drop you off at P6 drop-off point. One of the main on-site carparks at Gillette Stadium. 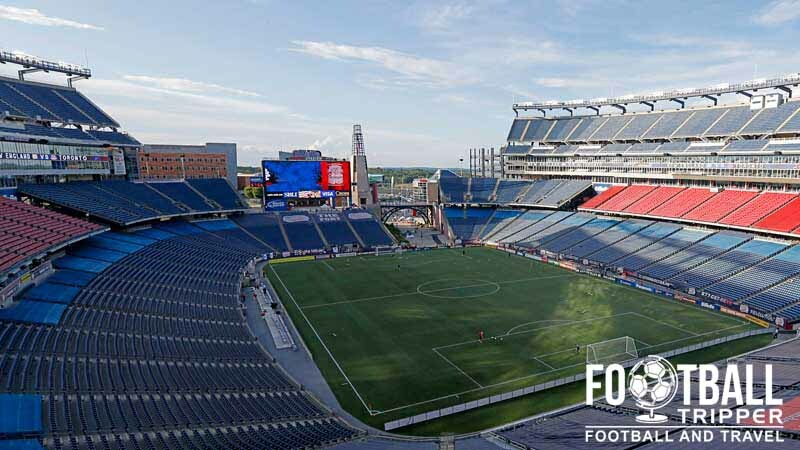 The closest accommodation option to Gillette Stadium is undoubtedly the Renaissance Boston Patriot Place Hotel which is located within the immediate complex. Around a mile or so on Route 1 is Americas Best Value Inn which as the name suggests is much more affordable.